Born: 1881 Pakenham. Killed in action: 19 July 1916 Fromelles. Timothy Patrick Halloran was born in Pakenham in 1881, one of John and Johanna Halloran’s eight children. His parents John and Johanna settled in the Pakenham area in the 1870s when the Gippsland railway was being built through the district. In the early 1900s, Timothy was actively involved in local sports playing football and cricket for Pakenham. Later, he worked in the Leongatha district of South Gippsland, where he was a labourer around Wooreen and a forester at Berrys Creek. Around Leongatha, Tim was remembered as “one of the best sports that ever donned a jersey”. 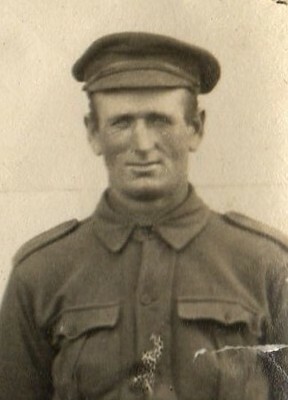 Timothy enlisted at Leongatha in July 1915 at the age of 33. He left Australia in late 1915 bound for Egypt, then re-deployed to the Western Front. Once in France, Timothy’s Battalion took part in the Battle of Fromelles on 19/20 July 1916. Nearly 1,700 Australians died, including Timothy. Since Timothy was initially reported as missing, his family and friends back in Australia held onto the hope that he had been taken prisoner of war by the Germans. There was no confirmation of this however, and nearly a year later, Timothy’s distraught mother Johanna wrote to the military authorities. Someone who had served with Timothy had contacted her to say that he had been killed. Johanna now sought official confirmation of this “as the suspense is very hard for us old people”. Enquiries made via the Red Cross ultimately established that Timothy had indeed been killed in an Australian attack on the German trenches. A fellow member of his Battalion provided the following account of his death: “On July 19… about 7pm at Fleurbaix Timothy Halloran was shot through the stomach, he was the next one after me down the creek and I heard him say ‘I am done for I’ve got it’. I did not see him as I went on but men in the line behind said that he died”. Another eyewitness “saw soldier wounded by a bullet in the stomach out in No Man’s Land about 150 yards from front line trenches… A mate wanted to carry soldier in but the soldier said ‘no’. He didn’t want to be moved as he was dying, did not know what became of him afterwards”. After his death, Timothy was described by Corporal Claire Whiteside, who knew him at Leongatha, “as a great favourite amongst us. In all circumstances, he was ever the same good-natured chap”. 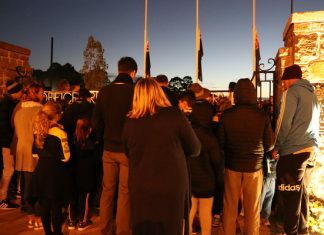 The local Leongatha newspaper also noted that Timothy was “well and favourably known in the district, especially amongst followers of football. He was the most popular man in the Leongatha team, and also highly respected by members of opposing teams, for he was always good-tempered and one of the fairest players that could be wished for. He played the game well and it was most fitting that he should fight for his country when the time came”. Sadly, Timothy’s body was never identified and he was presumed buried somewhere in No Man’s Land.